As I put things away (yes, I'm STILL unpacking and organizing! ), I ask myself, "How can I use this item to make my home more appealing?" This ten-cent tin once held marbles, paperclips, and other bits and pieces. Now it stores envelopes of sugar-free Apple Cider. Not only does this save space, it's a pretty addition to the coffee cabinet! 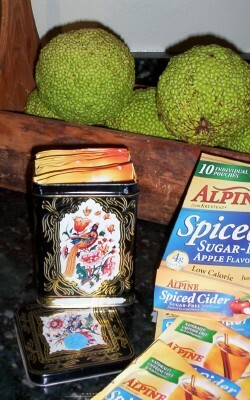 PS--If someone you love is on a diabetic or low carb diet, make sure they have sugar-free cider mix in the pantry. It is a great substitute when everyone else is enjoying seasonal drinks. This is a cute idea. I do something similar...I use old pyrex dishes with lids for things like hot chocolate envelopes!